Cardinal Edward Cassidy, "Reflections on Covenant and Mission"
Excerpted from his book, Ecumenism and Interreligious Dialogue (New York/Mahwah: Paulist Press, 2005), 252-256. The year 2002 saw the publication of a statement in the United States that created great interest among Jews and Catholics involved in dialogue. On August 12, 2002, the Ecumenical and Interreligious Affairs Committee of the United States Conference of Catholic Bishops and the National Council of Synagogues USA issued a truly remarkable document entitled Reflections on Covenant and Mission. This was the result of discussions between leaders of Jewish and Roman Catholic communities in the United States, who had been meeting twice a year over a period of two decades. For some time it had seemed to many that the time was ripe for a study on the relationship between the two covenants that basically describe the nature of the two religious communities, and on the consequences of that for Christian mission. The document Reflections on Covenant and Mission is an encouraging response that marks a significant step forward in the dialogue, especially in the United States. The Jewish and Catholic reflections are presented separately in the document, but affirm together important conclusions. The Catholic reflections describe the growing respect for the Jewish tradition that has unfolded since the Second Vatican Council, and state that "a deepening Catholic appreciation of the eternal covenant between God and the Jewish people, together with the divinely-given mission to Jews to witness to God's faithful love, lead to the conclusion that campaigns that target Jews for conversion to Christianity are no longer theologically acceptable in the Catholic Church." The document stresses that evangelization, or mission, in the church's work cannot be separated from its faith in Jesus Christ in whom Christians find the kingdom present and fulfilled. But it points out that this evangelizing mission goes far beyond "the invitation to a commitment to faith in Jesus Christ and to entry through baptism into the community of believers that is the church. It includes the church's activities of presence and witness; commitment to social development and human liberation; Christian worship, prayer, and contemplation; interreligious dialogue; and proclamation and catechesis." But given the "utterly unique relationship of Christianity with Judaism" and the many aspects of this spiritual linkage, "the Catholic Church has come to recognize that its mission of preparing for the coming of the kingdom is one that is shared with the Jewish people, even if Jews do not conceive of this task christologically as the Church does." 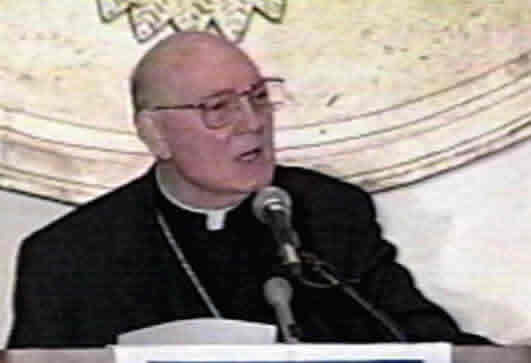 In view of this, the document quotes Prof. Tommaso Federici and Cardinal Walter Kasper to state that there should not be in the church any organization dedicated to the conversion of the Jews. From the Catholic point of view, Judaism is a religion that springs from divine revelation. The quotation from Cardinal Kasper states: "God's grace, which is the grace of Jesus Christ according to our faith, is available to all. Therefore, the church believes that Judaism, i.e., the faithful response of the Jewish people to God's irrevocable covenant, is salvific for them, because God is faithful to his promises." Since, in Catholic teaching, both the church and the Jewish people abide in covenant with God, they both therefore have missions before God to undertake in the world. The church believes that the mission of the Jewish people is not restricted to their historical role as the people of whom Jesus was born "according to the flesh" (Rom 9:5) and from whom the church's apostles came. It quotes the following statement from Cardinal Ratzinger: "God's providence... has obviously given Israel a particular mission in this time of the Gentiles. " Only the Jewish people themselves can articulate their mission, "in the light of their own religious experience." The Catholic section of the document concludes with this profound statement: "With the Jewish people, the Catholic Church, in the words of Nostril Aetate, "awaits the day, known to God alone, when all peoples will call on God with one voice and serve him shoulder to shoulder." There is, first, the mission of covenant—the ever-formative impetus to Jewish life that results from the covenant between God and the Jews. Second, the mission of witness, whereby the Jews see themselves "and are frequently seen by others" as God's eternal witnesses to His existence and to his redeeming power in the world. And third, the mission of humanity, a mission that understands the Biblical history of the Jews as containing a message to more than the Jews alone. It presupposes a message and a mission addressed to all human beings. The God of the Bible is the God of the world. His visions are visions for all of humanity. His love is a love that extends to every creature.... Adam and Eve were His first creations and they are created long before the first Jews. They are created in the image of God, as are all of their children to eternity. Only the human creation is in the divine image. Tikun ha-olam, perfection or repairing of the world, is a joint task of the Jews and all humanity. Though Jews see themselves as living in a world that is as yet unredeemed, God wills His creatures to participate in the world's repair. Finally, the Jewish reflections point out certain practical conclusions that follow from the threefold "mission" in classical Judaism, and which suggest a joint agenda for Christians and Jews. The reflection begins with the following statement: "Although Christians and Jews understand the messianic hope involved in that perfection quite differently, still, whether we are waiting for the Messiah—as Jews believe—or for the Messiah's second coming—as Christians believe— we share the belief that we live in an unredeemed world that longs for repair." Then the reflection asks: "Why not articulate a common agenda? Why not join together our spiritual forces to state and to act upon the values we share in common and that lead to the repair of the unredeemed world?" Looking then to the Talmud, the document draws from that source thoughts about repairing the world, giving details of charity directed to the poor and deeds of kindness to all, the poor and the rich, the living and the dead; creating an economy where people are encouraged to help one another financially as an expression of their common fellowship; fulfilling obligations to the sick and mourners; and preserving the dignity of the aged. While Jewish law is, of course, directed at Jews, and its primary concern is to encourage the expression of love to the members of the community, it points out that many of these actions are mandatory toward all people, and quotes the Talmud: "One must provide for the needs of the gentile poor with the Jewish poor. One must visit the gentile sick with the Jewish sick. One must care for the burial of a gentile, just as one must care for the burial of a Jew. [These obligations are universal] because these are the ways of peace." Not everyone in the two communities will agree with all that is stated in this document. In fact, when these reflections were published, they created a wide-ranging dispute within the Catholic Church in the United States, but also in wider ecumenical and interfaith circles. Most of the argument centered on the question of whether or not Christians should desire and pray for the conversion of Jews. There was no question in this discussion of church organizations aiming to convert Jews, but leading church officials expressed the view that it would be absurd to think that the mission given to the church by Christ is for pagans and not also for Jews, when all of Christ's preaching and his call to conversion was addressed precisely to the Jews. At the same time. Pope John Paul II has on a number of occasions made it clear that the first covenant has not been revoked and that therefore the church is called to concentrate on its mission "with" the Jews, rather than "to" the Jews. The national Jewish-Catholic dialogue in the United States has certainly posed a challenge that can and should be fully shared by Christians and Jews.